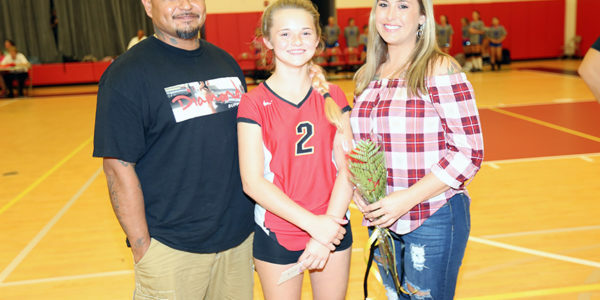 BRIGHTON — Pemayetv Emahakv Charter School’s eighth-grade parent night for its volleyball team is the middle school’s version of a high school’s senior night. 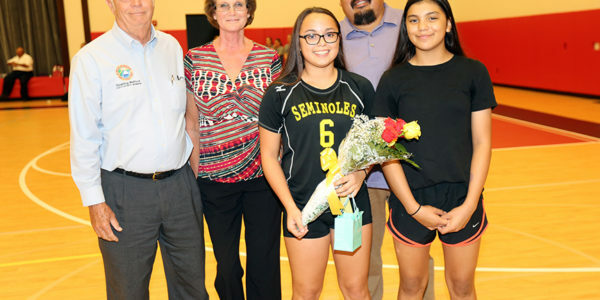 On Oct. 5, PECS honored its eighth-graders before they finished their middle school volleyball career and head to high school next year. 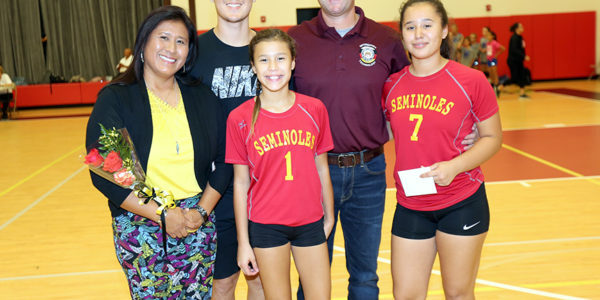 Before facing Osceola Middle School, eight Lady Seminoles were accompanied by family members to midcourt where they were greeted by varsity coach Pam Matthews and junior varsity coach Mary Huff in front of the stands at PECS’ gymnasium. This season’s varsity squad featured five eighth-graders: Leilani Burton, captain Karey Gopher, Tafv Harris, LaShae King and captain Elle Thomas. 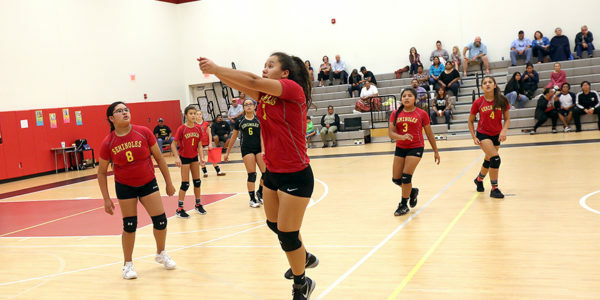 The JV had three eighth-graders: Kayln Hammil, Tammy Martinez and Angelie Melton. 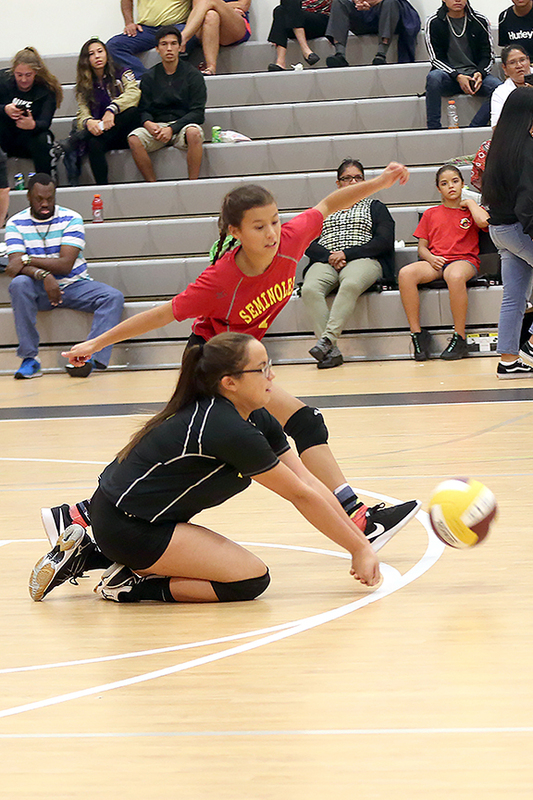 The eighth-graders favorite volleyball memories – which were shared with the audience – tended to be from the humorous side when something unexpected happened on the court. For Elle, it was when the ball went off her sister Lexi’s arms and hit Karey in the face. 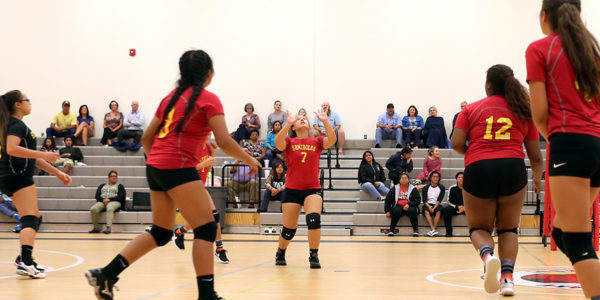 Karey and Tafv’s favorite memory came when a serve by the other team hit Tafv in the chest. Once the ceremony ended, attention shifted to the matches. 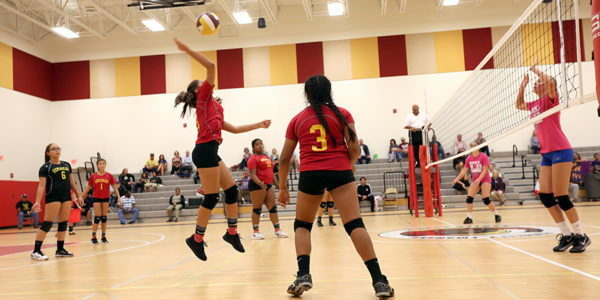 The JV team won in two sets (25-16, 25-12). PECS trailed 6-1 early in game one, but rallied behind the powerful serving of Jana Johnson, whose hard, low serves handcuffed Osceola’s defense. 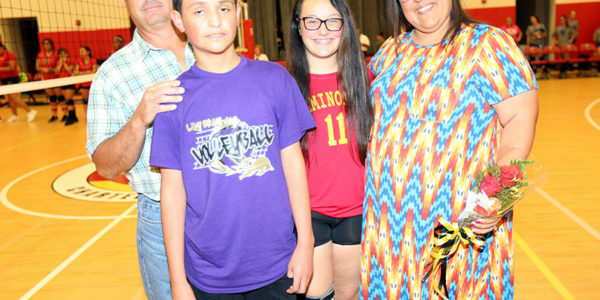 Javale Anderson won a key point at the net late in the set and Taryn Osceola, who had strong serves throughout the match, delivered an ace to help seal the victory. In the second set, Karlyne Urbina blasted a couple of aces to stake PECS to an 8-5 lead. 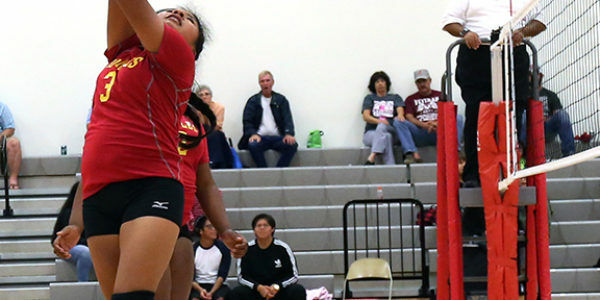 More service gems came from Angelie, who delivered a pair of aces late in the match. 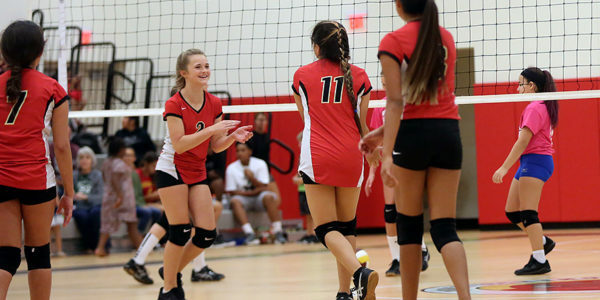 Coach Huff said it took some time for her JV team to become acclimated to her coaching style this season, but once on board, the squad was nearly unstoppable. 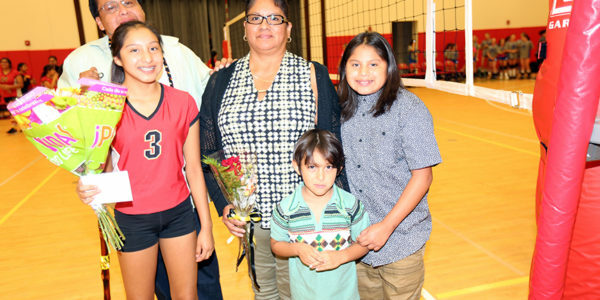 The team had lost only one match as of parent night. 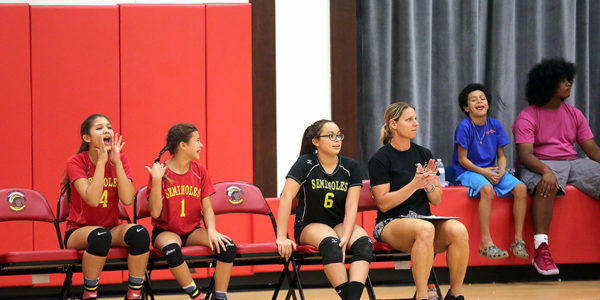 “It took a little bit for the girls to get used to my coaching. 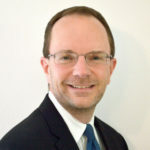 They responded well and they’ve done a great job and everything that I asked,” Huff said. 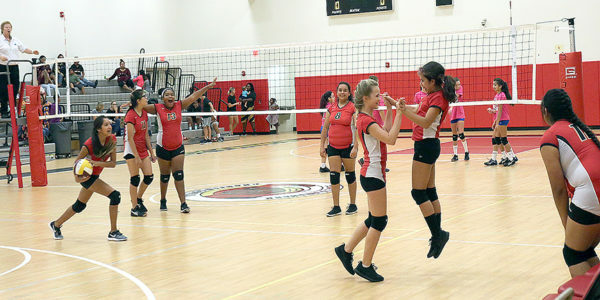 Osceola Middle prevented a PECS sweep by winning the varsity match in two hard-fought sets, 25-22, 25-20. “We played pretty well; I’d say we could have played better. We struggled to get the ball to our hitters,” said coach Matthews, whose daughter Sydney played on the other side of the net for Osceola. 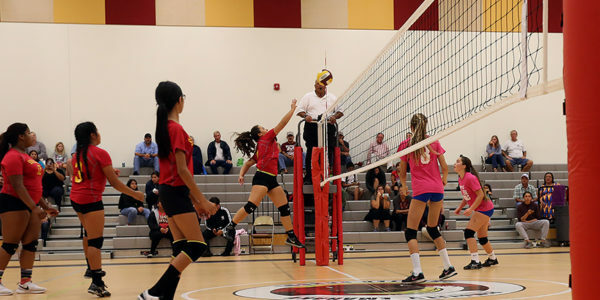 PECS started on a strong note as Elle blasted a kill for the match’s first point. She had an ace to give PECS a 7-5 lead and her younger sister Lexi also produced an ace to make it 11-6. 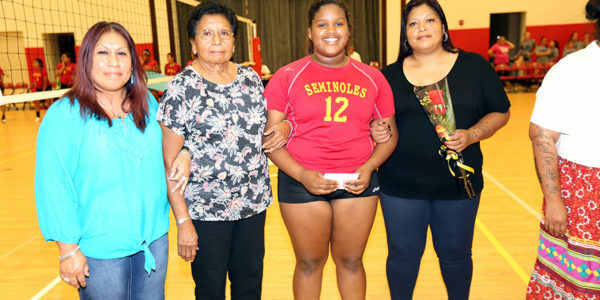 After Osceola pulled to within two points at 18-16, Karey came through with two consecutive aces to make it 21-16. But Osceola staged a late comeback and emerged with a 25-22 win. In the second set, PECS trailed throughout, but gamely fought to stay alive. Elle won a tip ball at the net for a point and Karey and Giselle Micco followed with aces. 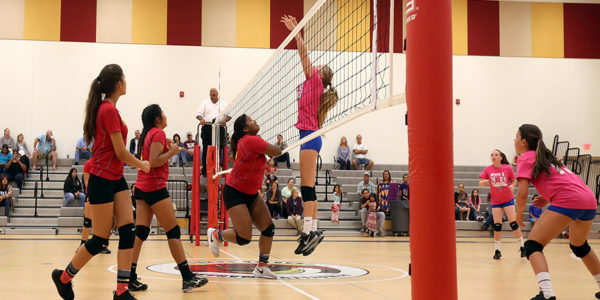 Late in the match, Elle smashed a kill and Tafv won a battle at the net to keep it close, but Osceola held on for the victory. 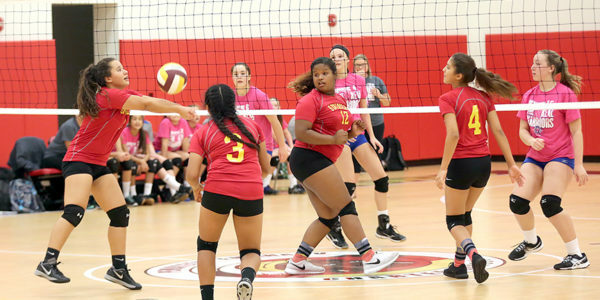 The varsity squad concluded its season Oct. 21 with a third-place finish in its conference tournament. 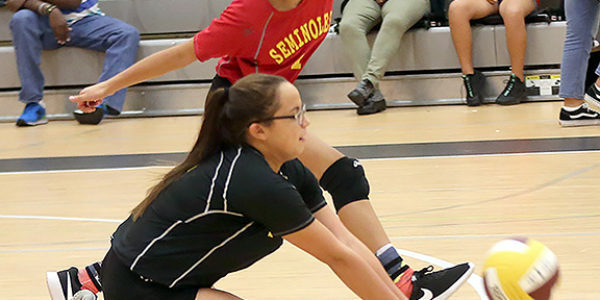 Giselle led the team to a victory against West Glades (25-7, 25-15) with a team-high 11 service points. PECS then fell into the losers’ bracket with a 25-19, 25-22 loss against Yearling. Karey notched a team-high 11 service points. 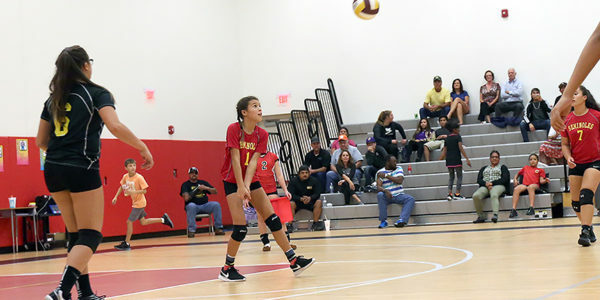 In a semifinal match, PECS started off with an impressive 25-13 win in the first set against Osceola, but Osceola rallied to win the next two (25-10, 15-6) to advance to the final. 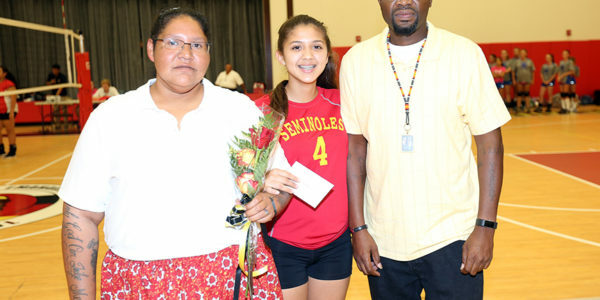 Yearling beat Osceola in the championship 25-19, 28-26. PECS finished with a 9-4 record and some well-earned praise from its coach. “Overall, I am very proud of the team,” Matthews said. 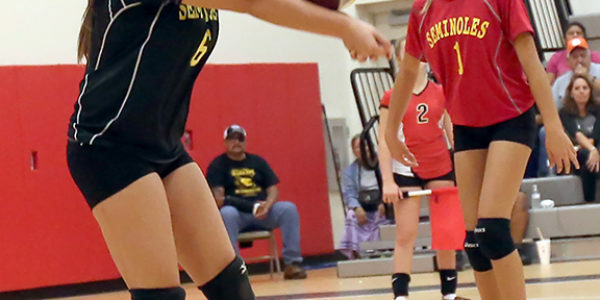 Next year could shape up to be another strong season with the return of four varsity players (Lexi Thomas, Nena Youngblood, Giselle Micco and Melina Steve) along with the ascension of at least some, if not all, of this year’s strong JV squad, whose returners are Saniya Rodriguez, Winnie Gopher, Taryn Osceola, Karlyne Urbina, Javale Anderson and Jana Johnson.